Picture this - Your innermost desire for a long long time has been to produce a professional recording at your home recording setup. You have been wanting to showcase your talent to the world, be it family, friends, or relatives or to a recording label or to popular TV shows like American Idol. You have frequently put off that purchase of a high grade microphone as it typically had a high price tag and perhaps have had to settle for a cheap microphone with average sound quality. You are now absolutely ready to take that plunge and make that investment in an affordable high quality Microphone for your home recording. But you end up spending enormous amount of time looking for a good value but high quality microphone for your hard earned money. If this is you, this blog entry is intended to help you look at nicely priced microphones that really shine with quality and help you make a more informed decision quickly and acquire a good quality microphone at an affordable price. I hope this article helps you cut to the chase. I have compiled a list of the Five Best High Quality, Reasonably Priced Microphones (including USB microphones) in the market based on their popularity, ratings, and preferred buying patterns on various websites. A professional high quality microphone is an absolute must for your needs as an aspiring singer, voiceover artiste, podcaster, or internet radio jockey, and is key to getting your message across most effectively. This is key to fulfilling your long cherished dream. One advantage with USB microphones is that they make it easy for you to integrate these into modern-day powerful laptops/desktops, and get the best out of the computing power. The Audio-Technica AT2020 USB Condenser USB Microphone tech specs show that the frequency response is excellent and will pick up bass very well as will it pick up sharper treble sounds that are acceptable for home studio recordings. Besides it can be mounted on a shock mount and hence be employed to get professional quality recordings. The Max SPL data shows that this is a great price-performance ratio for home/studio applications, however, this is a lower threshold at 124 DB than other microphones in the list. Overall, a high quality microphone to consider purchasing and at a great price point of less than $100. An even better deal than the AT2020 is the Audio-Technica AT2035 Large Diaphragm Studio Condenser Microphone if you are looking for a non-USB studio quality microphone - the product is now available at around $100 (normally $200+). The Max SPL at 132 Db with 0.5% Total Harmonic Distortion is an impressive capability to turn some of the loudest sounds into quality recordings. Frequency Response is excellent and so is the Super Cardioid Large Diaphragm Condenser. This is really a great buy at current price of around $100. 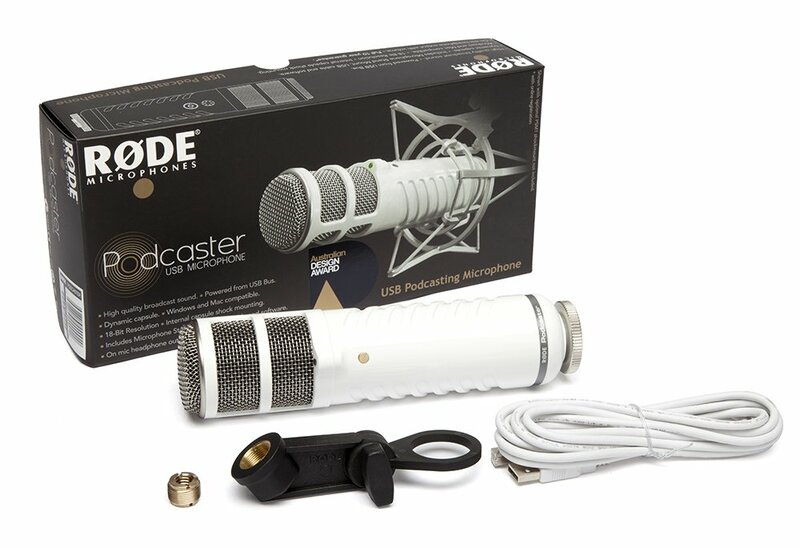 The reputation of the Rode line of products and the considerably large size condenser capsule along with the 48k sampling rate go for the Rode Podcaster as major attraction points for a buyer. The downside is the lack of data on Max SPL in the technical specs. The Rode NT1A is a non-USB microphone that is a cool winner given the quality and price ratio. Huge value for money in my opinion. 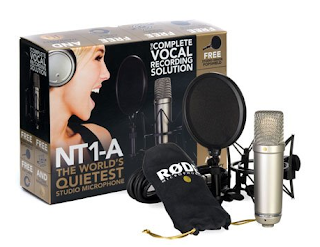 Available as the ‘Complete Vocal Recording Solution’ this NT1-A package now includes everything you need to get truly professional vocal recordings - the world’s quietest studio microphone, a studio grade pop shield and shock mount, a premium 20’ cable, dust cover, an instructional DVD with recording tips, and of course RØDE’s industry leading ten year warranty. 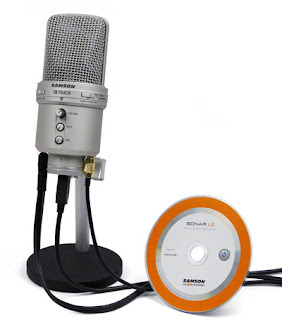 If you are not tied to buying a USB-based microphone, this is the best deal you can get with an all-inclusive package including a shockmount, pop filter, microphone bag and a truly great microphone with superb frequency range, excellent Max SPL threshold, excellent sampling rate of 48K, and a large diaphragm condenser capsule. This is truly a professional microphone system to consider buying for the recording enthusiast. To optmize your experience with this microphone, you will need to purchase an external audio-to-USB interface or an XLR-To-USB converter that adds a bit more to the overall cost. I recommend the M-Audio MobilePre USB Mobile Preamp and Audio Interface if you are looking for an audio-interface to hook up both the microphone and any other instruments to your computer. A cheaper and easier alternative if you are hooking up only the microphone to your computer, is to buy an XLR-USB Converter that lets you connect your Rode NT1-A microphone to the converter which does the analog to digital conversion and the provides the phantom power as a pre-amp to delivers it to your computer through a USB port. I highly recommend the Blue Microphones Icicle XLR to USB Mic Converter/Mic Preamp for this purpose. The Blue Yeti USB Microphone is the latest entrant in 2010 on this list in that it is the only THX Certified USB Microphone in the market and at its price it offers the equivalent of 4 microphones through the ability to change polar pattern from Cardioid to Omnidirectional to Stereo to Bidirectional with sound quality comparable to many high end Studio Microphones. It features a 3 capsule array of condensers each of 14 mm - the trio make sound capture very sensitive and the quality is a super experience. Please read this detailed review about this product including a voice sample. 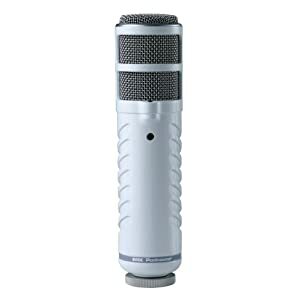 The NEWEST entrant in 2011 on the Blue Yeti line is the Blue Yeti Pro Multipattern Condenser Microphone , that features major improvements over the Blue Yeti USB Microphone. Both the Blue Yeti USB Microphone and Blue Yeti Pro Multipattern Condenser Microphone are best-in-class offerings that you will not regret buying. Blue Yeti Pro features industry best sampling rate of 192 Khz with 24-bit depth giving you incomparable sound capture advantages with the ability to drive the sound into a mixer using an XLR connection or into your computer through the USB interface. Blue Yeti USB microphone is the cheaper of the two and may be the best for your home studio application if you are a beginner in this space - and if you would like to go the full length then I'd recommend getting the Blue Yeti Pro - the Max SPL and excellent best-in-class frequency response in both the USB and Pro verisons, along with the 4 Polar Pattern support to give 4-Mics-In-One capability make the Blue Yeti a really good purchase candidate. In conclusion, the above Five Microphones are a very competitive set of studio quality microphones at very reasonable prices as each of them exceeds the value one would usually get at their price point for this class of products. Needless to say, these give you the best possible opportunity set up that dream home studio to record your voice as a singer, voice over artiste, podcaster or a internet radio host. Personally, my winner is the Blue Yeti USB Microphone , and Blue Yeti Pro Multipattern Condenser Microphone as it wins in many respects - take a look at its frequency response range (picks up the most sounds for clarity and richness and depth), the max SPL (sensitivity) for fairly large signal to noise threshold, and the triple capsule condenser array to give you multiple polar patterns and a really great price of around $100. I personally have owned a Blue Yeti for the last year or so and its been a superb experience. Plus, the price has dropped from the original $149.99 to around $100 which is a super deal! Very good review. I was looking for such a comparison based review. I love the Rode Podcaster and Blue Yeti and am still deciding between the two. I just wanted to thank you for the great review you have written. Proved very handy as I was trying to make sense of the features and tech specs of the various microphones in the market today. I went in for the Rode NT1-A after reading many reviews but your review was most helpful - the NT1-a is absolutely a delight to have besides I couldn't complain about the shockmount, and pop filter package. Thanks very much Justin. Glad the review was very helpful to you. I very much appreciate your feedback. For those who were looking for a shockmount for the Blue Yeti Microphone, I have found that the Sabra Universal Shockmount fits well for the needs. Hope this is helpful. Thank you for the review and the tip on the Shockmount for Blue Yeti. Been putting off buying the Yeti as I was looking for a shockmount myself for a while now. I am trying to make sense of this - the high end Neumann TLM-103 microphone sells for about a thousand dollars - its specs are somewhat close to the Blue Yeti Microphone except that the Max Sound Pressure Level is higher for the TLM-103 at 138db while the Yeti caps at 120db - not an awful big difference IMO. But the two products are priced poles apart. Any idea what makes the Neumann TLM 103 any higher end than the Blue Yeti? i have a doubt...if i buy a usb microphone,can i also connect it to a amp?? or do u need some special cable for that? If you have a USB mic you do not need an amp as the phantom amplification is provided by the USB powered channel. However if you want to connect multiple mics and or instruments etc to one computer and you are achieving those through an audio interface that has usb connectors, then you are good to go that route as well. Hope this helps. Do ask more questions if you have more. I need to research the Neumann TLM 103 mic more before I respond to you - from the little I have read, the value offered may be better sourced from a good mic at a lower price with good supporting audio equipment. Will post a review soon. Thank you for the question on Avid. The Avid Vocal Studio looks very promising in that the USB Microphone which is a Cardioid microphone comes with the ProTools SE software which is a beginner's edition of ProTools but packs some punch in music creation with built in loops and virtual instruments, and that is a great price to get this offer along with a USB microphone and leather case. The only issue I see is that nowhere does M-Audio/Avid give full tech specs of the microphone - I don't see the frequency response range and Max Sound Pressure Level (Max SPL) data which are critical to judge the quality of the mic - not doubting the quality of offerings from M-Audio but I am in favor of full disclosure. The only tech specs I see are that it is capable of 16-bit 44-48 KHz sound sampling which is great for a home studio aficionado, and a sensitivity of -48 db @ 1 volt/pascal which indicates a great microphone at this price point. I also dont see any reference to a Shockmount or the capability of mounting the mic to a Standard Microphone Stand - but judging by the shape of the mic bottom, it looks like it will fit any standard shock mount that can then be mounted on a standard microphone stand. I also know that for every thing they sell, M-Audio/Avid require the hardware to be connected to use their software so even if you want just edit your songs, I suspect you will need to connect your microphone which is a bit of a pain to have to do that if you are setting aside edit time separate from recording time. With ProTools 9 (the full version), the hardware connected requirement is gone for the first time ever but it is not clear if the Avid Vocal Studio has been updated to that effect. All in all, I think this qualifies to be among the better deals due to overall package of hardware and software combination which is quite compelling but more specs would help make that a more informed recommendation. I have an ATM2020 and it is indeed a stunner for the price. But I also have an ATM 2035 (with a bigger capsule) and it is even bigger and better sounding than the AT2020. is well worth it. The AT2035 is the world's best studio mic for under $200, IMO--Like an AT2020 on steroids. Check it out before deciding. Thank you Nikto for sharing your experience with the AT2020 and AT2035 microphones. These are probably among the top microphones in the non-USB category. The diaphragms and the frequency response rate of these mics is better than the AT2020 USB microphone so yes, you are right these are among the best microphone. So glad you have this worked out. In fact the AT2035 microphone is available at Amazon today at just $95 which is a steal! In addition to the above comment, the good part about the AT2035 is that it comes with a shockmount and at this price, it is indeed a steal. Since this is not a USB mic, the mic requires either an audio interface plus pre-amp OR a XLR-to-USB converter. The M-Audio MobilePre USB Mobile Preamp and Audio Interface and the Blue Icicle XLR To USB Converter are recommended for this purpose. I'm buying a mic as a gift for a beginner vocalist who's recording on macbook pro with either piano or plug-in keyboard. I was ready to place an order for the Blue Yeti as a simple usb solution (since he's a beginner and not very tech-savvy), but I was wondering if (after hours of reading up on condenser vs dynamic mic etc as a NON musician myself!) 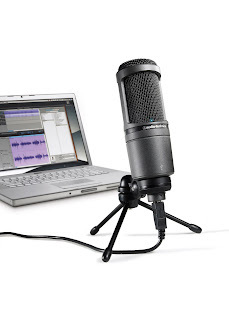 the Yeti might be too sensitive to background noise because it's a condenser mic for studio recording? I'm looking for one that could be used in a normal room, probably with him playing the piano while singing at the same time. I was wondering then if a dynamic mic like the Shure SM58 would be better? However, that would require an interface etc and I'm not sure how complicated that could get. What do you recommend? Thanks and sorry for the long Q! Thanks for the comment and question. I can relate to your dilemma here. Yes, the Yeti is a sensitive condenser mic with good studio qualit sound capture and can tend to pick up some background noise if the mic gain (mic recording volume) dial is set to the default middle or greater levels. But its surely not restricted to only studio uses - I use it at my home setting with a Mac Book Pro quite easily. If its any comfort, I have managed to record my songs in one of the smaller rooms in my single story home, with a 4 year old running around playing in other rooms :-) and have managed to keep his noise and sounds out of the range of this mic by keeping the uninsulated regular room door closed, and setting the mic gain lower than middle. I have a Blue pop filter fronting the mic on a stand up mic stand. So I can go fairly close to the mic (around 3-5 inches away) to be able to sing at a good pick up level. Hope the above was helpful and I do hope your gift recipient gets a great boost with your gift and does well with vocals. A small correction to the above, the Icicle's USB end connects to your computer through a USB cable and not directly to the computer. Thank you so much for the reply! Have placed an order for the Yeti and can't wait to see how that would work out! I was actually just more worried about the background noise but since you said it could work despite that, I decided it's worth a try. Plus the Shure would be more expensive an option in the end and require too many contraptions. Will let him start with something he can just plug and play for now. Thanks again for your help! don't you have the problem with the rode nt1-a being too sensitive (i.e. picking up background noise or even laptop/computer noise)? The Rode NT1-a is indeed a very sensitive mic but tends to have a higher bias for mid-range which is suitable for human vocal frequencies and some instrumentals - that problem of laptop/background noise is fairly easily resolved in a couple of simple ways for the large part by employing some physical adjustments accompanied with equalization adjustments. Place the laptop behind the mic at least a few feet away - the mic will tend to isolate the noises directly behind it as it is a cardioid/unidirectional mic. You should also set the recording input volume on your audio interface/computer low enough to narrow the surrounding sound range the mic will pickup - you can always amplify your vocals through software. There is of course the accompanying inconvenience of not being able to punch in and punch out when you want to do retakes. But for the large part I was able to isolate the background noise with this approach in my testing - ultimately I went for Blue Yeti USB - it too is a sensitive mic but I have shared my sound isolation approach here. The second thing to do is to use your software to isolate the background noise. Usually background noises are bassy in nature (such as someone walking in another room or you shifting positions causing some bass sounds to be captured. You can try to place a noise gate at 60 hz and below or use a high pass filter that filters out lower frequencies below a threshold along with a low pass filter that filters out very high frequency noises such as laptop noise. This can also be achieved through equalization adjustments. thanks for the quick and lengthy response, highly appreciated. Will have to decide between the Yeti and the Rode at the local store. Hi - Is there any store I can go to where I can test these mikes out in person? I has tested these by buying from the local Guitar Center at full price over a period of time and then returning the ones I did not want to carry. Its really not an ideal environment to test these at the store as it is quite noisy. I'd also add that while your own experience of testing is important to convince yourself, the idea behind my blog entry was to save some effort for the reader from having to go through the extensive testing cycle. I hope my blog entry is helping you in making your decisions. I have added my YouTube link to my name on this comment that has my song recordings on the Blue Yeti USB Microphone and this should also help you. Okay, thanks - Yes, your comments have been very helpful. 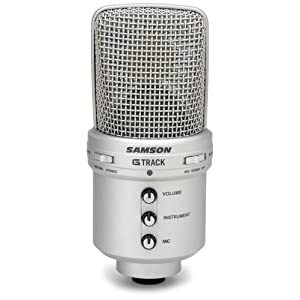 I've been trying to decide between the Blue Yeti USB mic and the Samson G-Track. I was hoping some retail outlet would have some sample mics in a corner of the store for customers to try out before I buy first, though. I know there has not been so much about the Samson G-Track. 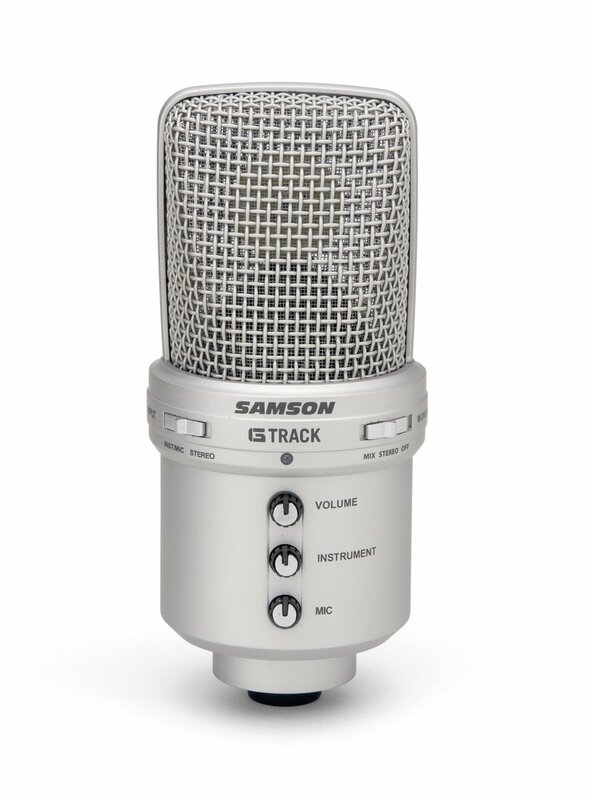 I am torn between the Samson and the Blue Yeti. I am starting out in voice overs and so on to the equipment. How is the Cakewalk software? Thanks for all you do. On Cakewalk (assuming you are referring to the Sonar home edition ) I have not used it myself but my friends have and each of them have only good things to say about it. Of course, once you start comparing it with Cubase, Pro Tools, Logic et al the feeling being torn between them returns :-) as has happened with me many times. I am glad that I got to read this thorough review on the mocrophones. It clarified lot of my doubts that would not have been possible to know without the real purchase of a microphone. This is really time saving & I now know at least what to buy & why? Thank you for putting a great effort in providing the deatiled review. Why Shure PG-42 USB & PG-27 usb not with them !!! I had not tried out these two mics until now. I did now after getting a couple of testing rounds. The mics are of reasonable build and stability but I also see the price to be part of the equation and at its price point, I find most of the ones I have listed above give you very good bang for the buck. Let me know if you have any inputs to add here. Does anyone knwo if I can use the digidesign mbox2 to connect the rode nt1a to my computer? Yes, absolutely you can assuming you already have it as the digidesign mbox 2 is no longer available. 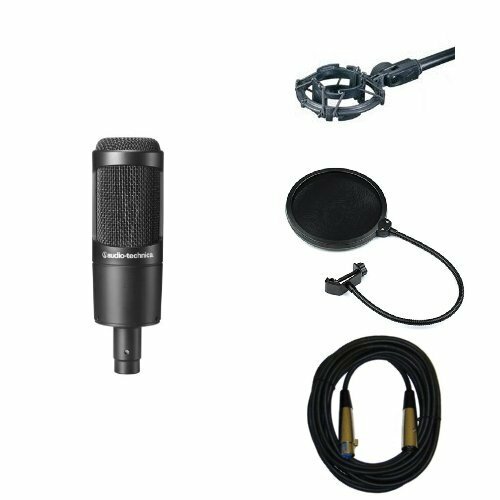 I really like the reviews but is there a good quality mic i could get for under 50$ ? Good quality is very relative to the user - it differs by individual interpretations of what bar you set. If you are looking for non-usb microphones under $50, then this link should help. You do need an additional XLR-USB converter to connect to a computer, or an XLR to audio input cable at the minimum or you need an audio interface or mixer to input into computer. Redshifter, thanks for such a good review. I am an online teacher and speak for hours on the computer everyday. Plus, I have to deliver in-room lectures to a lot of students via microphone. I will be happy to invest in a product which fulfills my needs and gives me clear, deep, noise free transmission. Is it possible to use one microphone for both my needs mentioned above, possibly with minimal equipment required? I can manage putting together wires and speakers, but can you tell me about exact things to put together for a good result? Thanks for asking this good question. For your use case, I think you should look for something that is lightweight, portable, yet powerful. I have not looked at any of the wireless headsets but some of those will probably be the way to go. Look for wireless, noise cancelling, pop filtered, cardioid, condenser microphones that go over the ear - many today are bluetooth enabled so you can use your computer to be the receiver for the audio and connect speakers to the computer. There are also bluetooth enabled speakers available these days but I am not sure of their quality levels or range in a classroom. I am not sure if this is helpful as much as you expected. I looked around a bit ( admittedly not much time spent on this) but one possibility is to use the Bluetooth Wireless Headset For Sony Playstation 3 PS3 which works with any computer that has Bluetooth capability. Many other options do exist - such as Lavalier mics with wireless systems that use UHF or VHF frequencies but these tend to be quite expensive. Thanks Redshifter. I have checked the playstation headset but I didn't find any outstanding reviews. I am not sure how reliable wireless microphones are because I cannot afford my voice to drop during classes. That's why I want to invest for a good return. What do the podcasters or online marketeers prefer? Their needs probably seem similar to mine. I am looking at Azden WLX-PRO VHF Wireless Lavalier Microphone System at 195$, is this what you referred to? Does it work for the in-room classes only? Is there a system in which I can use the same microphone to be plugged into the computer for online work and then into the speakers for in-room classes? On the question of what do podcasters and online marketers prefer, the jury is out on that. It depends on who you ask. Many folks have gone for Blue Yeti or Blue Snowball based on responses on this blog as well as Twitter- verse. Many folks I know have one mic for their podcast recordings and a separate set for their stage shows or courseware delivery. You are correct in wanting to invest in a good mic - the blue tooth one I suggested was based on the short research time I spent for this obviously every product will have its naysayers. One complaint I see with the Azden WLX Pro is that its build looks cheap and easily breakable.